In glaring contrast to its rich history, Arab astronomy today is in a miserable state, by all indicators. There is good potential, however, and a number of steps can and must be taken now to reverse the decline, say astrophysicist Nidhal Guessoum. In my article ‘Time for an Arab Astronomy Renaissance’, published in Nature in June 2013, I decried the sorry state of Arab astronomy today, in stark contrast with its golden era, which lasted from the early 9th century to the end of the 16th century CE. Today, the whole Arab world is home to only one astronomical observatory hosting a telescope with a diameter of more than 1 metre (in Kottamya, Egypt), which was built 50 years ago and produces very little publishable research. Contrast this with the dozen or so observatories in India and South Africa (each). The latter hosts an optical telescope with a diameter of 11 metres. This situation is quite astonishing, considering the existence of high mountains in many parts of the Arab world, the financial wealth of several Arab states, and the existence of a good astronomical community, both professional and amateur. Another indicator of the sorry state of Arab astronomy today is the dearth of university programmes and the weak research production, as can be measured in the number of papers that are published in indexed journals and in the citation figures for those papers. Most Arab universities do not even offer a basic introductory astronomy course that, I contend, all students should be required to take. This would help them to understand the universe around them, the sky above them, the phenomena that occur quite regularly (eclipses, solar eruptions, meteor showers, crescent observations, etc. ), and the discoveries that are announced almost every day (new planets outside the solar system, most notably). Stunningly, Arab universities that offer a B.Sc. degree in Astronomy can be counted on the fingers on one hand. 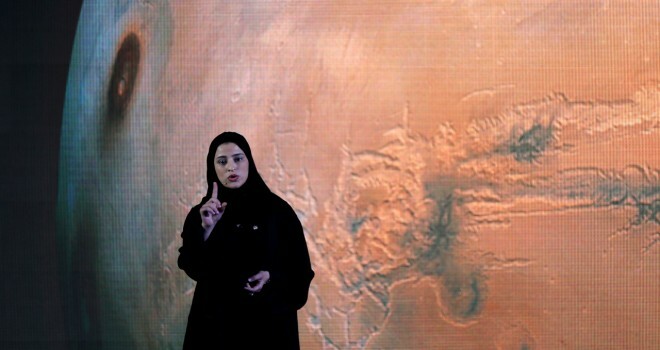 Very few Arab students graduate in Astronomy each year. At the postgraduate studies level, the situation is similarly if not more depressing. As to astronomical research, in my Nature article I presented figures showing that the total production in the Arab world is dwarfed by that of Israel, Turkey, or South Africa, in terms of both quantity and quality. Since the publication of that article, there have been a few positive and a few negative developments bearing on the future of Arab astronomy, in terms of the prospects for new astronomical facilities and for universities programmes. To make it easier for Arab ministries, agencies, and universities to start building astronomical observatories, my students Noora Alsaeed and Nada Abdelhafez and I conducted a theoretical research to determine the best sites for astronomical observations in the Arab world. We used a number of internationally recognized criteria, such as altitude, air transparency, number of clear nights per year, temperature profiles and humidity, which we extracted from online data. We produced a graded list of sites where astronomical observatories could be built: South Sinai in Egypt; Hejaz Mountains in Saudi Arabia; Ahaggar and Aures Mountains in Algeria; Wadi Rum in Jordan; Atlas Mountains in Morocco; Marrah Mountains in Sudan; Cheekha Dar in Iraq and Moyen Atlas in Morocco. Other sites were deemed less than satisfactory. It is my dream that astronomical observatories will be built at each of these sites within the next ten years. In my Nature article I estimated the total cost of building a major facility, including advanced equipment, buildings and local roads and infrastructure, at 50 to 100 million dollars. More modest projects, especially at sites that do not require large expenditures in infrastructure, could be undertaken for 10 million dollars or so. Last October, the UAE Government’s Information and Communication Technology Fund and the Dubai Astronomy Group announced the launch of a large astronomical observatory project with a budget of 30 million dirhams (8.2 million US dollars), to host a telescope with a diameter of 2.5 to 3 metres. Construction was supposed to begin this October in the mountains of Ras Al Khaimah, at an altitude of 1,600 metres. In Algeria, a project for the construction of an observatory in the Aures Mountains (Djebel Chelia, with a peak altitude of 2,300 meters) has been in discussion for years. Astronomers close to the project informed me that good administrative progress has been made lately, and work on the ground could start later this year. Finally, for the past several years there have been several mentions of astronomical observatory projects in Saudi Arabia, Qatar, and Iraq, but no official announcements can be found, let alone any evidence of progress on the ground. Astronomy education at Arab universities, however, is as bad if not worse than ever. The doctoral programme that ran at the University of Constantine (Algeria) from 2008 to 2010 remains frozen, waiting for administrative hurdles to be cleared. A Master’s programme that has been running for more than 15 years in the Institute for Astronomy and Space Science at Al-Bayt University, Jordan, is now practically closed, with no academic or administrative staff left. The one positive development is the start of a Master of Science in Astrophysics at Notre Dame University – Louaize, Lebanon, jointly managed with Université Saint-Joseph de Beyrouth. In order to redress the situation, the following steps must be taken: a) build observatories with 1- to 2-metre telescopes at the sites mentioned above; b) ensure the teaching of at least introductory astronomy courses at all Arab universities, particularly public ones, and establish interdisciplinary programmes between astrophysics and other fields; c) give scholarships to Arab students to pursue graduate programmes at various regional and international institutions; d) organize conferences of international standards, and publish their proceedings; e) conduct training workshops in astronomy for high-school teachers to ensure that various topics in the science curriculum are correctly presented to students and to instill the love of astronomy at the lower educational levels; f) enrich web content on astronomy in Arabic, as today a search for astronomical topics often only brings up astrological pages on the first page of links. Astronomy is truly beloved in the Arab culture; it is time to boost it on various fronts (educational, professional, amateur, media) and bring it to international levels. It has bountiful rewards to offer. By Nidhal Guessoum, published in Nature Middle East, October 22nd 2014.